When we first arrived in the woods every poo needed its own hole, which took a lot of time, and could be awkward in desperate moments. A compost loo was the best quick idea we could see to solve this problem, a big hole in which the rich nightsoil (we like that word) could break itself down, and harmlessly enrich the local earth. First was the hole, which as we’ve mentioned, provided clay for the window-cobbing. Next, we placed 4 straw bales around the trench, and pegged them down with hurdle rods, so there could be no dreadful tumbling accidents. The bales also heightened the action position, meaning our hole did not have to be so deep. Then a specially designed hurdle was made, with a hole in it. This meant our loo was a squatting only contraption, which everyone knows is the only way to poo wholesomely. 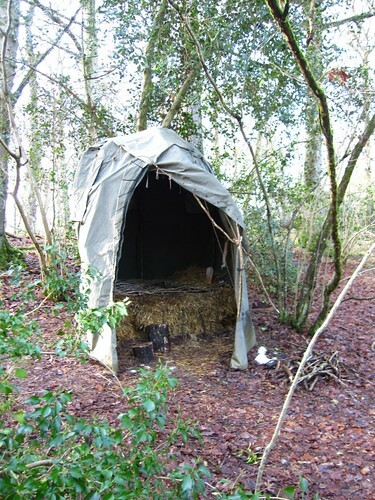 For guests who couldn’t handle this, there was a traditionally seated compost loo ten minutes walk away, at the other end of the wood. 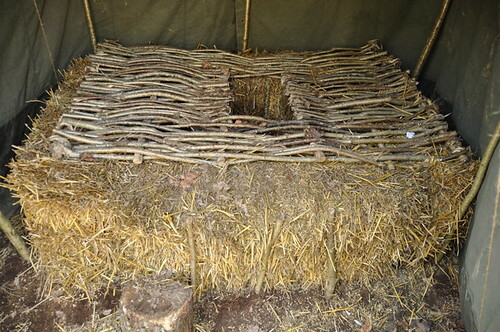 Lastly, a hazel dome frame was dug in and woven over the top of the bales and hurdle, which was itself covered in canvas, to keep the our heads, and the composting deposits, dry. What we dropped therein, we covered with either wood-ash, a useful double use for our regular stove clean-out. If wood-ash was short, then leaves sufficed. This helped with the breakdown. We often wonder how people justify dispatching their poo with drinkable water, when there is such a shortage in this land, and in others. For one thing, water is expensive! And it is heavy. Having to carry our water only a quarter of a mile made us appreicate the daily duty of water. Toilet paper was something we initially did without, but the regular guests in our winter home meant that this odd luxury was brought in, and often lingered after guests left. Certainly, the most local moss supplies ran low, and we were often glad of our toilet roll stash. 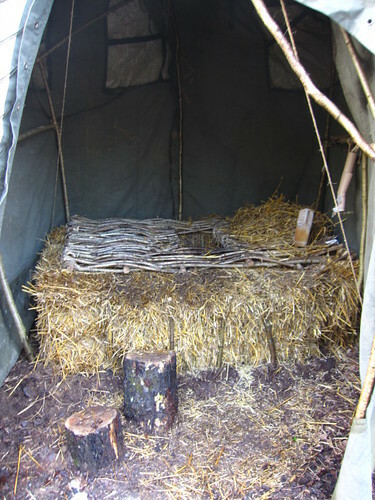 We can recommend heartily the act of compost-loo building, as an alternative to wasting gallons of good water a day. Every other living creature lets their excrement fall to earth, and we believe humans can do this too. gret post, but did you really have to put the last picture in?!!! Windblown, we have moderated this picture as contrary to the democratic will of our participatory audience. The picture is no more. We’re not sure if this was what the commentator wanted, but we’re tired, and unable to discern whether many explantion marks implies an outraged morality or an ironic wink at our poor taste. Either way, it was not the prettiest picture, was it???!!!!!!? For people who do want to see the compost loo in its unbelievable convenience and working glory, the picture is on our flickr page somewhere. I’ve never read such a load of crap lads! V. interesting.